So many Solo: A Star Wars Story toys, so little time (and money). As inevitable as the sun rising and setting, a new Star Wars movie is coming, and with it, tons of new toys—ready and waiting to empty your wallet even before you get to the movie theater. In fact, the monetary assault of Solo merchandise begins at midnight tonight, so if you’re planning on picking up a Wookiee or six ahead of the film, here’s everything that’ll be available. Although there’s no fancy name this time around (no “Force Friday” here! ), you should be able to purchase all the toys tying into the release of Solo: A Star Wars Story in the first minute of Friday, April 13 (unlucky for some, but never tell Han Solo the odds)—beginning at midnight tonight, both online and in whatever retail stores have decided to open for the event. Here’s what will be on offer. We saw these back at New York Toy Fair, but from tomorrow you’ll be able to own your very own saucily-eyebrowed Lando Calrissian. Joining Lando in Hasbro’s 6-inch wave of action figures ($20 each) is Han himself, Emilia Clarke’s mysterious character Qi’ra, and the Imperial Range Trooper from Solo: A Star Wars Story. The rest of the wave is rounded out by three figures from A New Hope: Grand Moff Tarkin, a Jawa, and a Death Star Trooper. There will also be a few extra retail-exclusive figures floating around from tomorrow: Target will have a new version of Chewbacca based on his appearance in Solo, complete with fancy goggles and a new (well, technically old, I guess) rifle, while Walmart will have the muddy Mimban Stormtrooper. Hasbro has updated the “Force Link” gadget first introduced with last year’s Last Jedi figures, letting you wave the wrist-mounted tech near the compatible 3.75-inch figures to play corresponding sounds and lines of dialogue. From Solo, the first wave ($8 each) will include Qi’ra, Chewbacca, the Imperial Range Trooper, and Mimban Stormtrooper, while the rest of the wave is rounded out with Luke Skywalker in his Last Jedi robes, The Force Awakens’ Maz Kanata, and Rogue One’s K-2SO. That’s right, there’s no actual Han Solo in that wave—if you want a 3.75-inch version of the new movie’s titular hero, you’ll have to pony up $30 to get him as part of the Force Link 2.0 starter set, which also comes with the upgraded Force Link to use with the figures. Joining Hasbro’s 3.75-inch range will be a series of deluxe two-packs and vehicles that are also compatible with the Force Link wristband. For the two packs ($15 each), there’s a Solo set including Lando Calrissian and a Kessel Security Guard, while there’s also a Phantom Menace-themed Qui-Gon and Darth Maul, as well as a released Last Jedi set featuring Rose, BB-8, and BB-9E. Sets featuring alternate versions of Han Solo and Chewbacca, as well as Rebolt and a Corellian Hound, will be available at a later date. On the vehicle side of things, it’s a Han Solo-palooza. If you want to go small, there’s the Han Solo landspeeder set ($30), which comes with an exclusive version of Han in his gear from his younger days on Corellia, or you could go all out with the new Kessel Run Millennium Falcon ($100), which also comes with its own exclusive Han figure, as well as lights, sounds, and breakaway panels that reveal the battered ship underneath the shiny new exterior Lando’s given it. Lego officially unveiled its Solo sets earlier this week—get the full details here—ranging from adorable versions of Han and Chewie as part of the company’s chibi-style Brickheadz line ($10 each), to buildable action figures of Han and the Imperial Range Trooper ($25 each), to a whole slew of sets, up to and including the Kessel Run Millennium Falcon, clocking in at just over 1400 pieces ($170). If you’d prefer your Star Wars toy fun to involve running around firing darts at people instead of just playing with action figures, Hasbro also has you covered with new Nerf Glowstrike guns based on Qi’ra’s shotgun-esque blaster ($20) and Chewbacca’s rifle ($40). If you’re looking for something a little fancier, albeit not from Solo, the company will also have an electronic version of the Riot Baton from The Force Awakens and The Last Jedi ($30), which will light up and play sounds from the movies, but probably won’t block a lightsaber blade. Unless that lightsaber is also a toy, in which case you’ll be fine. But maybe you also want to dress up to go with your new toys? Well, I hope you like Chewbacca, because Rubies will have its own range of exclusively-Wookiee costumes for the whole family ($10 to $30). Guys get an almost big-foot looking onesie and mask, while the ladies have to make do with a “girly” version that comes with a skirt and fur hood. There’s even Chewie costumes for babies and dogs too! Did you honestly think Funko wouldn’t have approximately one zillion toys on the way for this movie? Well, they do, from Pop! Vinyls ($10 each), to blind-box Mystery Minis ($8 per blind box), and stylized “Wobblers” based on Han and Lando ($10 each). 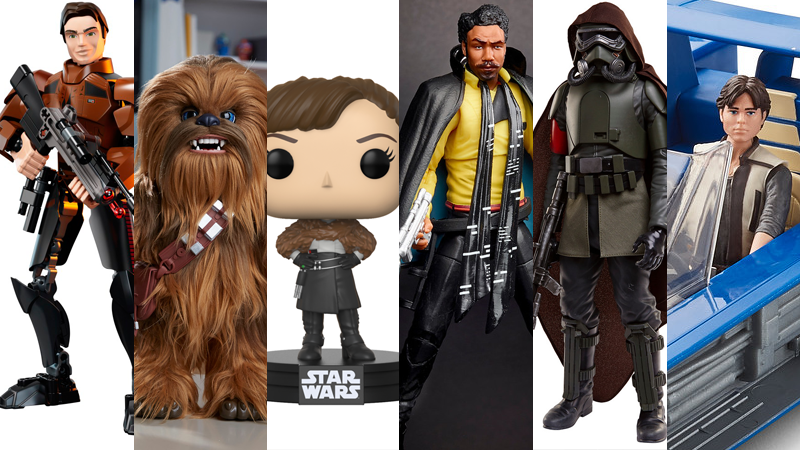 If that wasn’t enough, the Disney Store will also carry an exclusive line of pint-sized Solo figures from Funko’s Dorbz line ($12 each), featuring Han, Qi’ra, and two versions of Lando and Chewbacca—normal versions and then “rare” variants with alternate looks. And if you’re looking for something a little wackier from Mattel beyond the cavalcade of ship models they’ll have for Solo ($4 each, unpictured), they’ll also have a range character-themed cars ($5 each) based on Han, Chewbacca, and Lando from Solo, as well as R2-D2, Darth Vader, a Stormtrooper, and Boba Fett. If you’re looking for something a bit bigger for your young ones (or your young-at-heart self), Jakks Pacific’s line of articulated, plus-sized figurines is getting in on Solo too, with 18-inch versions of Han Solo and a Mimban “Mudtrooper,” as well as a 20-inch version of Chewbacca ($20 each). Without BB-8 or Porgs to lean on for adorable products, this year merchandisers have turned to the original Star Wars cutie/walking carpet for their adorable toys: Chewbacca himself. Hasbro is leading the charge with the Ultimate Co-Pilot Chewie ($130), a fluffy, 16-inch tall cutesy version of Chewbacca that responds to voice commands and motions to talk back to you (and even rocks himself to sleep)—but unfortunately, it won’t be available until this Fall. If you’re looking for something a little less pricey and something more immediately available, Seven20 will have a walking-talking fuzzball Walk N’ Roar Chewbacca for $25. And if you want something even smaller, albeit much weirder, Hasbro will have a Play-Doh Chewbacca ($15) that oozes the malleable goop out of the top of his hair for you to trim off like the world’s bravest barber.